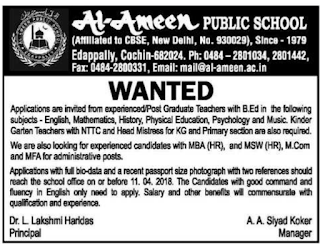 Al-Ameen Public School,Edappally has advertised in The Hindu newspaper for recruitment of Teaching /Non teaching faculty vacancies. Interested and eligible job aspirants are requested to apply on or before 11/04/2018. Check out further more details below. About School:AL-Ameen Public School – Adding contemporary thoughts keeping up with conventional values.AL-Ameen Public School can proudly claim to be one of the most progressive and esteemed institutions of Kerala. It was established in the year 1979 by AL-Ameen Charitable Trust registered under the Indian Trust Act. It is burgeoning institution which endeavour to provide quality education to children to have trust in the concept of unity in diversity. The Trust, which was established in 1978, aims at promoting equality based on class, sect and communal harmony.. 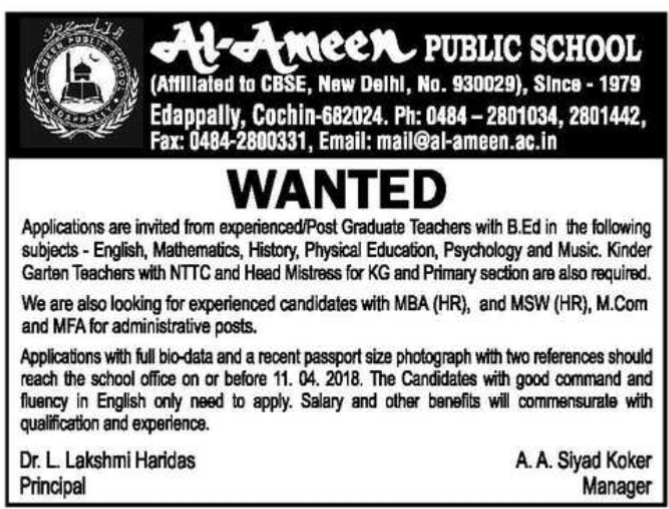 Applications are invited from experienced Post Graduate Teacher with B.Ed. Headmistress for KG and Primary section. Administrative post for Experienced candidates with MBA(HR),MSW(HR),M.Com and MFA. 1.Applications with full Bio-Data and a recent passport size photograph with two references should reach the school office. 2.The candidates with good command and fluency in English only need to apply. Last Date:Apply on or before 11th April 2018.